It came as a bit of a surprise to be asked by Stage Door Records if I had any photos of the 1985 Birmingham Rep production of Jeanne. This was my first big musical as a Deputy Stage Manager and I remembered it well. The show got a better reception in Birmingham than it did when it transferred to Sadlers Wells Theatre in London. Apart from normal cueing like flying and lighting, there were additional cues for smoke machines, dry ice and pyrotechnics. The technical rehearsal was a bit fraught…with me new to running a major show…but the Rep had a highly competent technical staff who saw me through. Bless them. Jeanne also had a great company of singers and actors with Siobhan McCarthy in the title role, Malcolm Roberts as Lieutenant General of the Army and Peter Straker as the Bishop of Beauvais who assisted in the inquisition of Jeanne…constantly amazing audiences with his incredibly high vocal range. 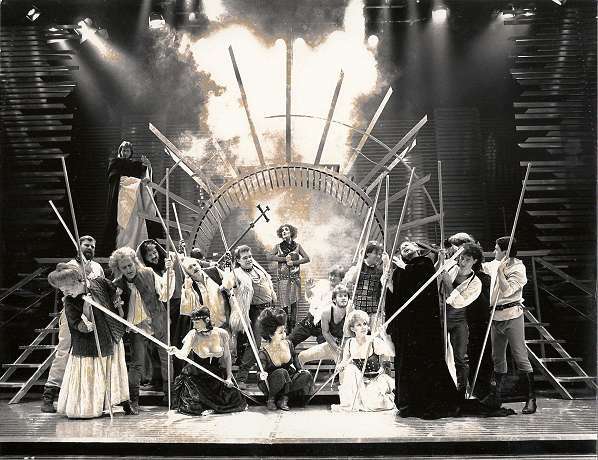 The set and costumes by Susan Benson were stunning as was Dave Horn’s atmospheric lighting. Robin Phillips worked wonders as Director and Anthony Bowles produced sensitive and highly effective vocal and orchestral arrangements of Shirlie Roden’s score. Although the run went fairly smoothly, there were a couple of incidents that stick in my memory… The day that Siobhan had a sore throat and was unable to sing…Shirlie Roden, stepped in and sang the part with aplomb. 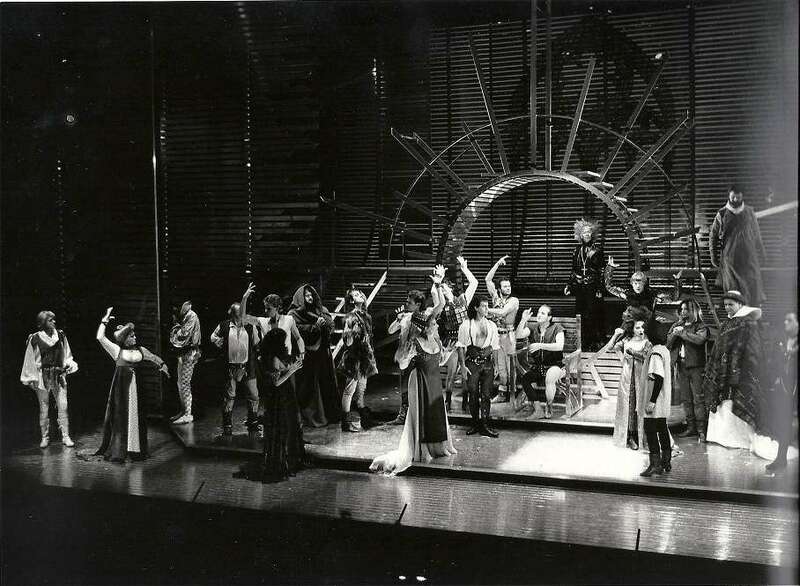 The second was at a performance when I had given clearance to David Steadman, the Musical Director after the interval to go to the orchestra pit. He took a little longer than usual, and I had already cued the house tabs before he reached the podium. If looks could kill, I wouldn’t be writing this account. Stage Door Records have produced a CD with the original Studio Cast that pre-dates the stage show. Some of my photos of the production are used in the accompanying booklet. I was delighted when I received a couple of complimentary CDs by way of thanks. Copies of the CD can be obtained from Stage Door Records.